Hi everyone, well here I am again with another Christmas card, that's another one for the box, thank goodness the numbers are starting to swell a bit now. This is one of the new Teddy Bo and Bea images I purchased the other day, (I'm sure you'll be seeing the others sometime soon) isn't she so sweet? Such a sweet card Chrissie. Love the gentle colours and of course Teddybea. Thank you for joining us for the challenge at Teddybo. Thanks for playing along at the TeddyBo challange! 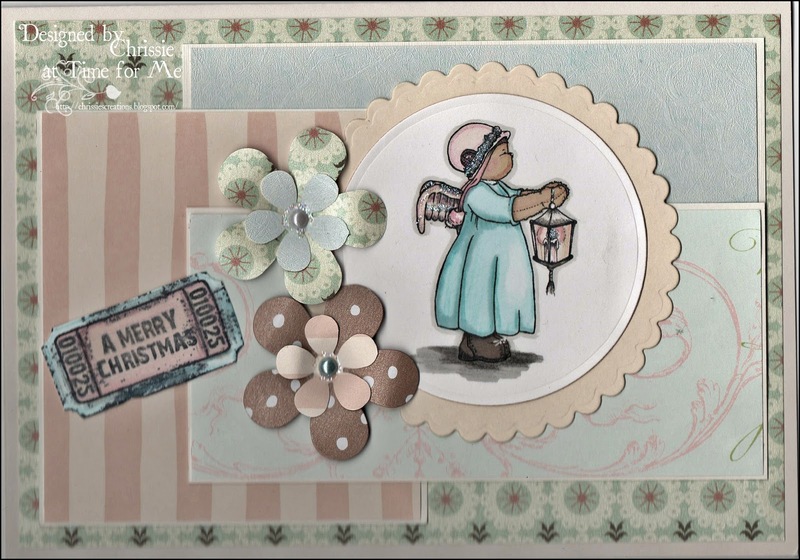 This is sooo soft and pretty Chrissie, LOVE that Merry Christmas ticket! Wonderful layout and beautiful colors! Thanks so much for playing along with us at Teddy Bo! What a beautiful card Chrissie,I love the image and your papers. Oh,this card is so sweet Chrissie,your choice of colours are just perfect,love it. It mite sound odd but I'm so glad you said it would have been better as a square. I feel that every time I do a rectangle card, so it's good to know I'm not alone. You card is beautiful and fit's perfectly with our pastel's challenge at Teddy Bo. I adore this one Chrissie the colours look super and what fab flowers and image, you are on a roll here. Thank you for sharing them with us at Teddy Bo.